Submitted for your contemplation, thousands of years ago an omnipotent being capable of extreme longevity visits our planet, he knows others are following although their arrival may be thousands of years in the future. He must move on but wishes to leave those who are following a message. The question is how would he leave the message? He could not write it on a piece of paper because it would eventually decompose, If he chiseled it in stone or some other material it would be ether eroded or covered up by the sands of time. He would need a media that would regenerate and continually seek the surface. Also due to the fact he would not know at what position on the planet the others would arrive, he would not know where to leave the message. So he also needs a media that could self populate so the message could be found just about anywhere with little effort. I think you can figure out where this is going but I will continue anyway. The answer is he would find an indigenes life form that exhibits the best possibility for survival and implant the message in their DNA. So are you the massager and if so have you delivered the message? This being said, what is known about the 99.9 percent of our DNA that is identical? Well until lately it was referred to as junk. This is due to the fact that genetic engineers could not attribute any function to the pairs of chromosomes. While there is still no known functions attributed to these pairs, research scientist have found that the encoded syllables for these pairs show repeating patterns much like a language. So are these patterns an encoded message left by an omnipotent life form. 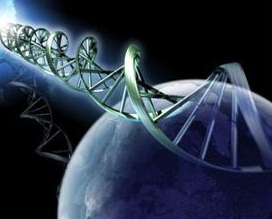 If we are a genetically engineered life form can the alterations to our DNA be what has given us our intelligence as a survival mechanism to preserve the message. I believe that mankind has evolved, and still is, not physically as from monkeys but mentally. Our intelligence is growing exponential with each generation. One only needs to listen to their children to know this is true. Our children know things that we had no idea about at their age. My grandson at the age of five could identify every type of dinosaur as well as many species of fish. He could tell you the name of a fish and whether it was a fresh or salt water fish. I did not know most of this until I was about 8 years old. Is this due to the amount of information available today or is because our mental aptitudes are evolving. Remember that an IQ is not the capacity of your knowledge but your capacity to gain knowledge. Well this concludes the inane ramblings emanating from the right side of my brain, but question remains, have you delivered the message? This is fascinating…I’d heard of this before but not in this much detail…is there a place to find more information on it?